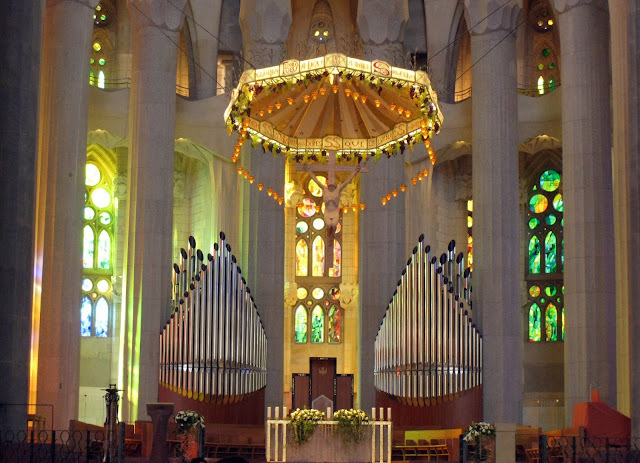 Gaudi, one of the greatest architects who has ever lived designed perhaps the world's most beautiful church, La Sagrada Familia in Barcelona. This video show you what it's like inside the church- the video is probably better than the pics below to get an idea of the beauty and awe the church. It's $20 to get in, the city continues to make residual revenues from the amazing work created by its most famous resident, a century and a half ago. It's hard to get an idea of the scope, size, and beauty without going there in person, but it's definitely worth $20 for the visit. Gaudi's work imitates nature, where he spent much of his childhood waling and contemplating. He was fascinated by nature's seeming perfection and symmetry and was the first architect to employ it to his work. If you go to Barcelona, make sure to stop by!